Looking for an obligation-free Rwanda itinerary? You’ve come to the right place. A family of mountain gorillas, led by a silverback, munches on leaves just meters away from you in Rwanda’s Volcanoes National Park. This is their last remaining forest habitat, and thanks to peace returning to this country, travelers can visit them. This surely ranks as one of the most extraordinary wilderness experiences anywhere, and it takes a specialist to get it right. 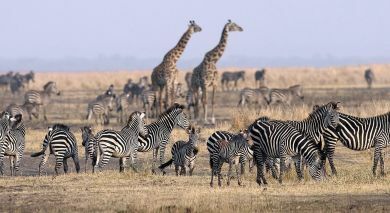 Enchanting Travels consultants are committed to crafting an unforgettable Rwanda itinerary for you. Reach out to us, to seal the deal on an exceptional holiday. On the ground, expert trackers will help you hike into the mountains to see gorilla families in their natural environment. Besides trekking to meet gorillas, other famous walking trails in this park include one to the tomb of the famous murdered gorilla researcher Dian Fossey, immortalized in the Hollywood movie Gorillas in the Mist. For years, civil war and genocide have marred life in Rwanda, and this background is never far away. In the capital Kigali, everyone should stop at the fine Kigali Genocide Memorial Center museum to learn about the country’s tragic history. At least 13 other primates live in Rwanda’s Nyungwe Forest National Park just two hours south of the capital city. A 197-foot-high canopy walk takes visitors through the lush mountain forest to meet black-and-white Angola colobus monkeys, chirpy baboons, grey-cheeked mangabeys, or curious vervet monkeys. These wonderful creatures will have you laughing and staring right back at them in awe. 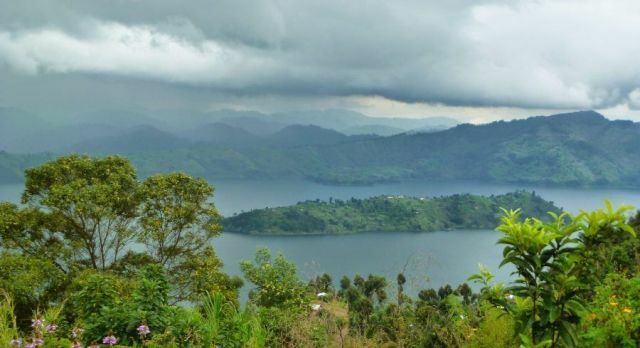 Due to its location on the equator, Rwanda has a pleasant, tropical highland climate with daily average temperatures of up to 25°C. Follow this link for an overview on when to visit Rwanda. From safaris to gorilla trekking and mountain climbing – Rwanda offers fascinating treasures. Let us plan your dream Rwanda holiday so you don’t miss out of any of the highlights. Follow this link for an overview on the things to do in Rwanda. An encounter with the giant and tranquil gorillas of Rwanda is something magical. Since these magnificent animals are almost extinct, the experience is not only impressive and bound to create a memory of a lifetime, but also most unique. Fear is a natural feeling when you face an overgrown gorilla – after all, the silver bridges gorillas are twice the size of an adult human being. But quickly you will realize that gorillas are peaceful and tolerant towards us humans. Unfortunately, this was not always reciprocal. The animals were almost exterminated and are sadly part of a global list of highly endangered animal species. Today they are only found in the jungles of Uganda, Rwanda and Congo. We offer gorilla trekking in the last gorilla retreat, Bwindi jungle in Uganda and Volcanoes National Park in Rwanda. Volcanoes National Park is home to over a hundred mountain gorillas that live together in families of up to 35 animals, and is a perfect place for your safari in Rwanda. A gorilla trekking is not a walk but an adventure. For four to eight hours, you cross the 4500m high volcano range to find the primate families in their natural habitat. Visitors are allowed in on rare occasions and kept to small groups, to ensure the animals are not disturbed. With two to eight other people and accompanied by an experienced tracker and game-keeper, the trek starts! 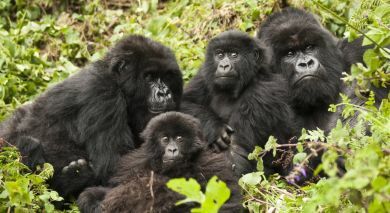 If you finally do become face to face with these wonderful gorillas, you will immediately forget the effort of the hike. Gorilla trekking takes place throughout the year, although the rain-free months – from July to October and from December to February – are recommended. Since the 1994 genocide, Rwanda has stabilized greatly. Democratic elections have been held and Rwanda is one of the most stable and safe African countries. 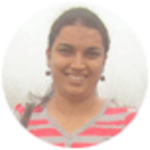 It is relatively easy, safe and simple to travel around in the country. With Uganda in the north, Tanzania to the east, Burundi to the south, and the Democratic Republic of the Congo to the west, the landlocked nation offers safe and secure travel experiences. Follow this link for more information on safety in Rwanda. The culture of Rwanda is seen best during its many festivals, ceremonies and storytelling. Intore (translated as the Chosen Ones), is Rwanda’s most famous traditional dance, comprising of females doing ballet, men doing a dance of heroes and a group of drummers. Drums are considered very important in the culture as royal drummers were given high status in the court of the mwami (chief). Music these days has been influenced by American hip-hop and R&B but also has traditional Congolese and East African elements in it. The crafts scene is also popular, and during one of our Rwanda tours you can observe the beautiful skill of basket weaving, or imigongo, a unique artwork made from cow dung mixed with naturally colored soils! Kinyarwanda is the official language and native tongue of most Rwandans but most people also speak a secondary language, such as French, English or Kiswahili. The majority of Rwandans are Christian (primarily Catholic) although many people also value their traditional beliefs and informal ceremonies are still held to worship the Imana (creator). Traditionally, the food that was eaten would depend on which ethnic group a community belonged to. 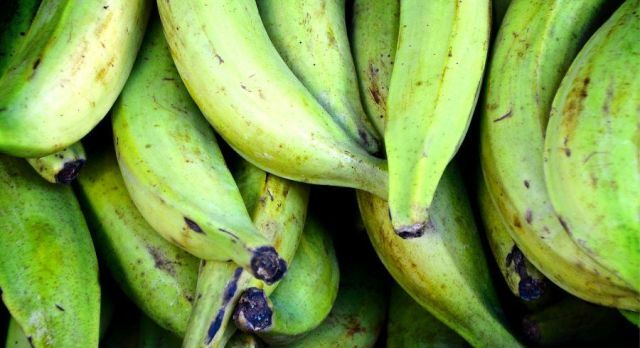 Today, Rwandan cuisine tends to focus around bananas, plantains, cassava and pulses, but there is a high consumption of dairy products also. During one of our Rwanda tours you will notice the presence of the ubiquitous potato, which was introduced by colonists. Today, potatoes have become a staple ingredient in some of the national dishes of Rwanda. Traditionally women were not permitted to eat goat meat. It was thought that it would make a woman stubborn and that she would grow hairs on her chin! Meat is not usually eaten by the Rwandans more than a few times a month. Only men drink alcohol, and their poison of choice is usually a locally produced beer. 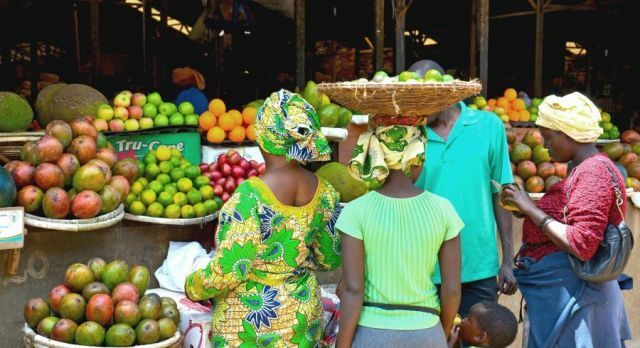 Snacking between mealtimes is a part of the culture of Rwanda – and it is usually tropical fruits, or streetside roasted corn or barbecued meat in the cities. Tilapia: a type of grilled/fried fish mostly found around Lake Kivu. Try urwagwa, an alcoholic drink brewed from plantains or ikigage, made from dry sorghum. Alternatively, opt for the popular beers of Primus and Mutzig. Eating in public is considered rude in Rwandan culture. Even grown adults will not eat in front of their in-laws or children. Adults do not eat sweets and therefore, it is considered insulting if you offer cake or chocolate as a gift during your tour of Rwanda. Being fat is considered positive in Rwandan culture, so if someone pays you the compliment that you have grown fat, don’t take offence. 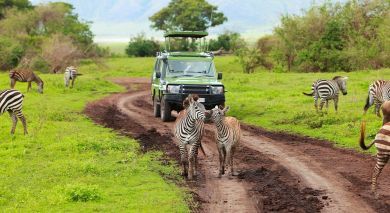 The Enchanting Travels team look forward to helping you plan your private and tailor-made Rwanda tours. Rwanda’s human history is thought to have begun after the last ice age. Kingdoms were formed and settlements were organized. Rwanda was visited by German Count Von Goetzen in 1894 and European missionaries followed. Five years later, the country became a German protectorate. The Belgians took control of Rwanda in 1915 after the First World War and divided the country into three groups: potters (Twa), farmers (Hutu) and cattle breeders (Tutsi). A national ethnic identity card was introduced two decades later that reflected which group an individual belonged to. This card played a key part in one of modern Africa’s saddest times. In 1959 the Hutu majority, supported by Belgium, overthrew what had been a Tutsi monarchy. Many Rwandans were killed or fled the country during this uprising. Rwanda obtained its independence in 1962, but the existing tension of ethnic division led to a 100 days genocide in 1994. This started when a plane carrying Rwanda’s president was shot down. The Hutu and the national army struck back at the Tutsi people. Rwanda’s genocide, that took the lives of 800,000 Tutsis and Hutu sympathizers, ended when a military group of exiled Tutsis, known as the Rwandan Patriotic Front (RPF), slowly took over the country. We highly recommend you watch the highly acclaimed movie, Hotel Rwanda, for an insight into this sad time in Rwanda’s history. Today, the country is peaceful and many of the two million citizens who had fled to neighboring countries have returned to their land. 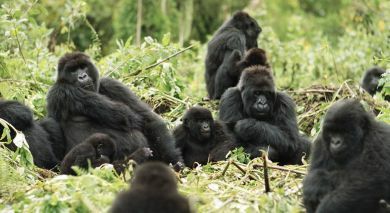 Tourism in Rwanda has increased, especially due to the opportunities for gorilla trekking in Rwanda.